Bad news for people in Illinois who might have a hankering for some eyeball tattoos: the Illinois senate recently voted to ban the procedure, which means getting the whites of your eyes injected with ink, is now one step closer to being illegal in the state of Illinois. The technical name for the procedure is actually not “eyeball tattooing” (although I like the sound of that), but scleral tattooing. This new law proposal will go to the House on April 15th and will then be debated. Yes, I know that some of you will be crushed by this should it in fact become law, but if you’re really desperate to get ink jabbed into your eyeballs, there just may be a loophole. The Senate’s one exception for the procedure is in the case of licensed doctors doing the tattooing. In that case, the tattoo is done for people who have corneal scarring as a result of some sort of eye trauma like a cut or a burn. It’s basically like a cover up, but it’s a far cry from the high fashion of eyeball tattooing. Also, very few doctors actually perform the procedure. So I guess the books will soon be closed (at least in Illinois) on that sort of tattooing. Personally I think eyeball tattooing is lame. It’s like being the kid who is always trying to one up everybody else so that people will pay attention to them. It doesn’t look cool and it’s not like a tattoo, which can be appreciated for its artistic and personal merits. 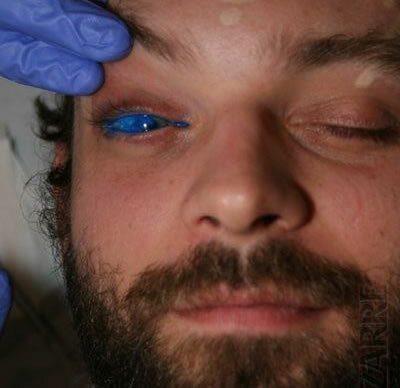 No one’s getting a portrait of their dead grandmother on their eyeball, so really, isn’t it just an excuse for pretentious jerks to walk around with their corneas all blue? Hey, I call ’em as I see ’em.